Amaranthus is Greek for unfading, in allusion to the unwithering bracts. Bracts are modified leaves generally associated with flowers and often confused with petals. 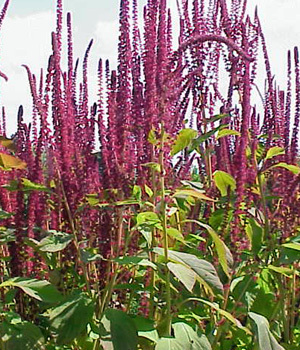 Also known as tassel-flower. The specific epithet name of cruentus means bloody, possibly in reference to red colored flowers. Foliage can be colorful, good as dried flower. Commonly grown in the garden.